Everybody loves themselves a good kitchen sink. A good kitchen bowl is pleasing to the eye and touch, does not clog prematurely, prevents the accumulation of food and buildup of bacteria and makes washing and cleaning easy. A lousy kitchen bowl, on the other hand, can make your kitchen the most unpleasant area in your house. It will clog, be an eyesore, breed bacteria and make even the simplest tasks like washing and cleaning difficult. So, if you’re in the market to upgrade your sink (or are just plain tired of your old one), then we have the perfect product for you. Kindred’s FMSB654NB Double Bowl Stainless Steel Kitchen Sink is one of the best kitchen sinks on the market today, and we’re going to tell you all about it. First, let’s get started with its features. What do we like about the Kindred? After testing the Kindred extensively for a prolonged period, we are glad to report that this product is of a high-quality, does everything it claims to do and does it well. The Kindred comes in a standard double-bowl design which has been adopted and improved well by the industry. The dimensions of the Kindred are as follows: the sink as a whole measures 33 x 19 x 6-½ inches and each bowl measures 14 x 12-½ x 6-½ inches. It is apparent from a glance at the dimensions that the Kindred is big enough to allow users to wash and clean without any substantial difficulties. The bowls are very deep at 6-½ inches and allow for hassle-free cleaning by preventing water spillover to the countertop. Something that we initially had an issue with, though, was the proportion of the bowls’ dimensions to the dimensions of the sink as a whole, but keep in mind that the sink contains four holes for faucets and other accessories, so the proportions are justified. The Kindred FMSB654NB is made of 22-gauge stainless steel and comes in a single satin finish for both the deck and the bowls. We were satisfied with the finish but not so much with the construction. However, there is a perfectly valid justification for that. The 22-gauge stainless steel construction means the Kindred is thick enough to handle everyday tasks, but unfortunately, it is not as thick as some of the 16, 18 and 20-gauge sinks on the market today. While stainless steel is one of the best materials to construct a kitchen sink with, it is prone to scratching (unlike quartz and acrylic mix). However, during our time, despite some deliberate attempts to scratch the Kindred, it did not scratch. This is a testament to the quality of the finish, which is also pleasing to the eye and touch and almost makes up for the Kindred’s slightly downmarket construction. However, the construction is justified as the Kindred costs less than a hundred dollars. Compare that with a quartz sink, which costs nine to ten times more than that! The Kindred is very easy to use and operate and makes light work of most washing and cleaning tasks. It features extra-deep bowls, so the water does not splash or spill over to the countertop. 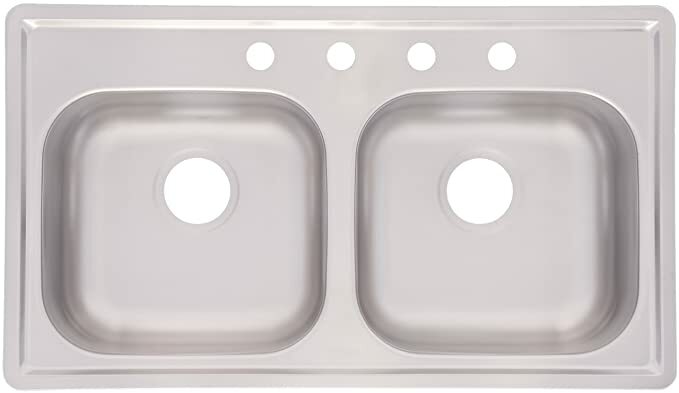 The drain plugs (or waste holes) are located at the back of the bowls, making this sink one of the most trouble-free sinks as the wastewater drains effectively, leaving behind minimum stains or residue. The sound deadening pads also make their presence known while you’re cleaning, as they absorb most of the irritating vibrations that get annoying after a while. Cleaning the Kindred is easy enough as stray food does not stick to its sides and the finish ensures that minimum stains are left on the sink. The Kindred FMSB654NB is one of the best sinks on the market, and we guarantee that you will not regret buying it. Yes, the construction could’ve been better, but, keeping the price in mind, the Kindred is a steal!